This is what I wore on Tuesday to meet Patrick, my ex-boyfriend, for one last catch up over coffee. He's moving to another city, and he wanted to talk to me before he left. It was five minutes until the time we'd agreed to meet, and my stomach was in knots. I was cruising down the street, fiddling with the radio dial as I made the turn into the parking lot. Every station I hit was playing a song about a broken romance. Even the country station was playing The One That Got Away. I hit the power off button a little too forcefully. I reached my destination and pulled into a parking spot. Right across from me, I spotted his car. Just relax Linda, he's a friend. Remember that...you're just friends now. As I walked into the coffee shop, the very same one where we'd had our first date, I saw him. He looked exactly the same, if only a little more muscular. He looked good. He smiled and came up to me to give me a side hug. "Hey, how have you been?" he asked. Then began the initial small chat. You know, how's the folks, how was school, etc. We sat down at a small table and sipped our coffee as we caught up. He managed to slip in those old, thoughtful compliments he used to give me too. Not in a flirtacious way however...it was more genuine than that. They were his honest observations. For example, while talking about a girl with a strong personality I'd encountered, he added in, "Well you have a strong personality as well." "What I mean is, yes, you're very sweet, but you're no pushover," he elaborated. Its things like that that reminded me why I'd fallen for him. At one point, he brought up our past. He told me he had never thought it had been a waste of time or was all for vain. He wouldn't trade our past relationship for anything. He'd become stronger in his faith because of me, and I had inspired him. When he said that, I felt my jaw start to wobble a bit as emotion overcame me. But I blinked a couple times, breathed deeply, and when I looked back up at him, my eyes were dry. "You helped me too," was all I said. He was always the one better with words. For me, my mind is a chaotic field of thoughts, where no single rational sentence can be formed in the midst of battle. Only later, when I write, can the chaos be formed into sanity. I resent that, and I wish I could be as poetic with words on the spot. We sat there for about two hours, talking and laughing like we used to. We conversed about everything, leaping from subject to subject. There were many times we slipped back into our old jokes with one another. It was like we'd never stopped our conversations. Its also made me realize something about love. When you truly love someone, you give a piece of your heart to them that you'll never get back. Love is risky and painful. I still am missing that piece I gave him, and I can feel the ache from knowing it'll never be recovered. He has it, and I'll always love him. Some days I'll wonder why it had to be him and why it had to end. Why did I have to fall in love with him? Why couldn't we work out? Other days I'll remember our time together fondly and not feel saddened to know its over. I can reflect on it peacefully. Yet every day, no matter how I feel, I know that he was someone important in my life. Love is a powerful thing to play with, and it's a gamble. When we said goodbye, I pulled him in for a tight, quick hug and stepped into my car. As I backed out, I glanced over my shoulder at him. I couldn't resist one last peek. He looked over at the same moment, with an expression I couldn't discern on his face. Was it sadness? Was that a hint of panic in his eyes? Perhaps it was blank, and I was just projecting the emotions I wanted to see onto him. I didn't know, and my head was hurting from fighting back watery eyes. So I just smiled sadly and drove away. It was at the stoplight when I finally let the built up tears slide out. He'll always be my friend. He'll always be that person that inspired me to be better - at life, my health, even my grades, and most importantly, my faith. He'll always be that man that has everything I want in someone. Its like I told my friend later: "This is going to sound like a corny romance novel gone wrong, but he was my first love. I'm never going to be completely over him. He has a part of me that I'll never get back, and I'm always going to love him. Time will help those strong feelings fade, but I know I'll always care for him." I don't know what God has in store for me, but I know that if I'm patient and learn to give my heart to Him, it won't be broken. Oh really cute pants and lovely cardigan! ohh my gosh so pretty! Oh, darling-what a hard thing that must have been to say goodbye like that. There are so many times in life when we wonder how our lives would have turned out if some circumstance had been different, I pray that God would grab your heart and just give you clarity! Clarity is one of my most prayed prayers- most of the time I just don't understand life otherwise! Just keep being the beautiful person you are :) and I know God is using you and your ability to be transparent with us in great ways! Oh Linda, this is such an honest account of your feelings, and I just wish I could be with you after your meeting with him. You handled your final farewell so perfectly, though, I believe. He probably thought you had the same look on your face when he looked back--one which neither of you could really interpret, but kind of bent to make out whatever you were feeling. But yes, this is so well written. Keep on writin' those novels, because I adore reading them. You're so honest, and I feel like that's the root of why people blog--to be open and genuine. You are that and so very much more. I'm glad you two learned from each other--and that's even more amazing how he said he cherished his time with you when he had the chance. Such a respectful guy. You are totally worth everything in the world! Also: "...and I wish I could be as poetic with words on the spot." Right? Man, I can only think of all the times I've walked away and thought of how I could have better strung together a sentence of words. I have these elaborate conversations and such with myself, but then when I speak in real life, you would never think I was the same person writing on my blog. Crazy! Ah, and now onto your outfit, Miss Plucker of Emotions. I really adore your braid, first off, and kind of want to wear a braid like that in my next post (gonna steal it from you, hehehe!). I love that duck print cardigan, too. It's so silky and sheer! Loving the bird print, and what a fabulous bag! It is so hard to leave someone like that - they are always going to have a special place in your heart. How wonderful that you could meet and talk as friends; that isn't always the case. Still, it is never easy. Sending some hugs your way, hon! By the way, that cardigan is just adorable! What a beautifully written post! And I love the shade of that blue. It's gorgeous! Loved how you styled the headband :) Super cute! Oh Linda. My heart goes out to you doll. I've faced that several times and it's so hard. It's so sad, because he seems really into you. It's ashame he's moving away. You handled it well and left a really good impression. You never know how he may come back into your life at a later time. Just continue doing the things in front of you and ask GOD to lead you in the right direction. Oh wow, I was all ready to comment on your lovely green shirts you are sporting, then read about your experience with your ex. It is so horrible and terrible to have to lose somebody, it feels like the end of the world. It's nice you were able to meet up but I can really appreciate how hard that could have been for you, it's almost like taking a step back in the whole 'getting over him' process, isn't it? Hope you are okay and this is not playing on your mind too much! Hi Linda, firstly, you look beautiful, you couldn't have picked a more perfect outfit. It must have been such an emotional coffee date, I can't imagine how you went through with it, and you are so brave for that. I hope that it gave you closure and made you see how important you were in his life and how valued your relationship was. It will only be a love learning curve and a stepping stone to something and someone even better. These pictures are stunning and I LOVE the kimono. Love it, I tell you! Can you just write a book? Please? I've said it before, but you have a way with words. Reading this took me back to my very first love. I was a lot younger (16 or 17), but the way I felt about him was earth shattering, if that makes any sense. As young love often goes, we broke up. He was actually the one to break up with me and it broke my heart. For a year I continued to be wrapped up in him. I thought about him constantly, would hope and pray that he would just pick up the darn phone and call me and tell me he wanted me back. After all, what we had was perfect, right? It seemed every time I started to actually move on, he would pop back up and set me back a million paces. It was a never-ending cycle that left me in a bizarre state of hoping we got back together and hoping to move on for good. Then came my knight in shining armor. It's a funny story of how our relationship came to be ( I should share it on the blog sometime), but he was just what I needed at the time I needed and all I had ever waited for. We are still together today (after almost 6 years! ), and plan on getting married someday. In the meantime, please keep sharing your words. Oh, and write a book so I can read it! Sending lots of love your way, beautiful! 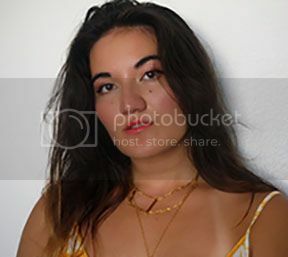 it's true you never forget your first love- hope you are ok. At least you have a beautiful kimono and I am positive that God is looking out forr you! the outfit is totally love Linda!! the kimono and those pants are match made in heaven!!! this ensemble is perfect for summer and i can imagine myself wearing something like this!! CHIC!!! I do so enjoy when you open your heart and share yourself via that wonderful prose of yours. Of course that bag is shiny and fun and those pants quote cute.on you. And that top, wow dear. That is such a lovely and exciting piece. But what I will remember most.is.how you can successfully and beautifully channel what's inside you o to the page. As for first loves, the real ones do become a standard you measure the rest against. But those strong feelings, good or bad, appreciate and treasure them. That's your passion and your amazingly strong heart talking to you. Wonderful post! I read a quote somewhere that I remembered when reading your post. "A woman's heart should be so hidden in Christ that a man should have to seek Him first to find her." 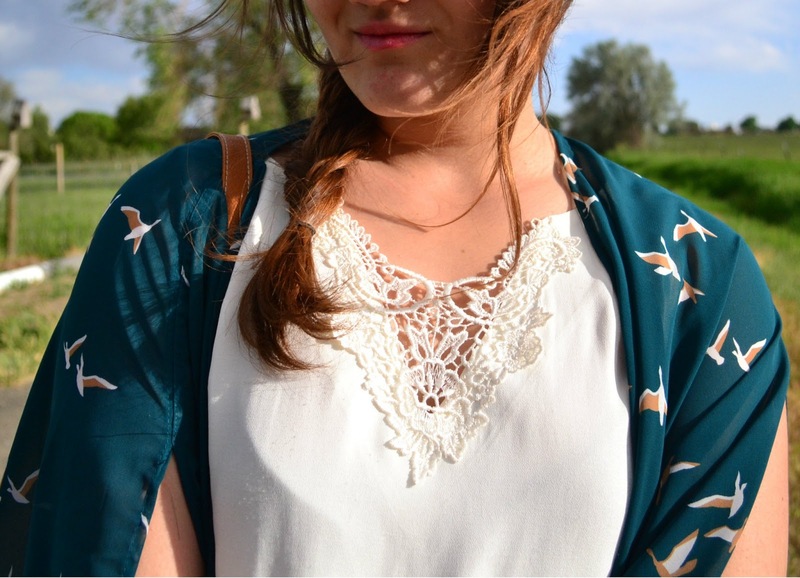 love your blouse with the birds! Aww what a sad post, I just want to hug you! im surprised you say he speaks better than you, your post are always so beautifully written, especially this one! anyway, amazing post and amazing outfit!! Oh what a sad story, sometimes we have to say goodbuy. Though, I realy believe that if it's a real love then it will find you again. I also like ur look, casual and romantic:) Nice pictures, well done! "When you truly love someone, you give a piece of your heart to them that you'll never get back." -this is so true. That bird print is adorable! It must've been really hard to meet up with him and have all those old feelings come back. Hope you're doing okay after it! I was just singing that verse you quoted. Why does Patrick have to be so amazing, such a torture to just stay friends with someone that means to you a lot and thats amazing. You are way too young to be sweating some guy ;) Cool look btw. that cardigan looks lovely on you! Awww, Linda! I'm glad that it was a nice meetup, but I'm sorry that you're hurting. I definitely know how that is and I know that nothing we can say will make it better. But I hope you know that you have a GIANT support system here. And at least you looked fantastic! This color combination is such a no-fail. And I'll never get over this adorable jacket! oh my god, I nearly cried while reading your story. It's touched me a lot since I felt like that too, just with the fact we're no friends anymore.. Just try to look at the good things which happened and thank god you could meet him and be together with him. That helped me a lot and I guess I don't feel much about that person anymore..
Oh Linda. I don't doubt that every regret and heartache you feel is reciprocated by his own. You are beautiful, talented, smart, kind, everything a guy could want. Don't give up, you'll find someone better than you ever could have imagined, because you deserve it! Love you, girl! I feel for you, it must have been a very hard experience, but I am very proud of you that you were able to get through it. This kind of things make us stronger, yet it was good you let yourself cry. No point holding it in. Stay strong my dear blogger friend. omg I loooove this top! <3 You look lovely dear! btw, I'm pretty much in love with that bag. it's so my cup of tea! First loves are impossible to forget. But at least you're still friends and that's a good thing, you can preserve all the good memories and still talk with him when you miss him! oh hoooow cute is this kimono! I adore your pretty bird kimono, but heartache, not so much! Its nice that you guys could sit down and talk like that before he left though! Great outfit!! Love the flowy top. Oh Linda, I wish I could just give you a hug. You write so beautifully and thoughtfully and it's wonderful that you have this space to share your thoughts. Keep your chin up, because an even better guy will come along. You are such a sweet and caring person, and one day you'll find someone just as sweet! Pretty blouse :) you look beautiful!!! Such a pretty look! Love the blouse. This is such a poignant love story. "When you truly love someone, you give a piece of your heart to them that you'll never get back." I really really agree with you on this. It breaks but yet again you would be happy knowing the person you love has a piece of you. I don't know what exactly happen or why the both of you are no longer together but friends instead. Just from this post, I gathered that it is due to the fact that he is moving? On a separate note, I like the colour of your jeggings. You are so gorgeous and I love this kimono! Also adore your writing, it's good when you become able to talk openly about a past relationship. but i'm sure you will find someone GREAT for you so don't worry. Hope you have a great weekend! Thank you for commenting on my blog! Everytime I read a post of yours like this, i'm taken back to my teenage years when i used to read teeny bopper books and i used to get butterflies in my stomach for the sweet things, and then get almost teary eyed whenever I read something like this. you should totally write a book, Linda! I can feel exactly what you're feeling with how you wrote it. I'm so sorry things can't work out between you guys but if you're really meant to be together, love will find a way. At least he didn't just leave you bitterly and you can think about your past with him as a happy memory. oh linda. just hang in there. i know the feeling. but there's always a good in goodbye. hang in there! firsts are always hard esp when it comes to a well spoken guy, but there will be better things for you to come I promise!! 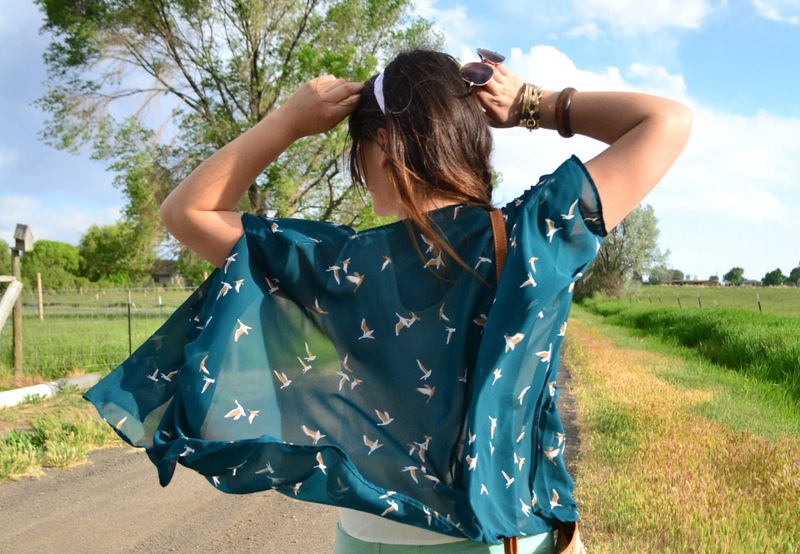 The outfit is so cute, I love the shirt in kimono style and how it works with the mint pants! Girl, thanks for being honest. At one point in my life, I thought that Leon and I were not going to get together, and we also had a closure moment. It was one of the hardest talks I ever had, and there were so many lumps in my throat I couldnˊt talk. there's always a first romance in everyone's life. But you're so young, you have the whole life ahead of you, and most important: somewhere out there is your last romance waiting for you! Anyway, your writing skills are impressive <3 maybe you should do some writing(e.g. a diary)and publish it in a couple of years; just a thought.